and gloves (if you have sensitive skin or allergies). 2. 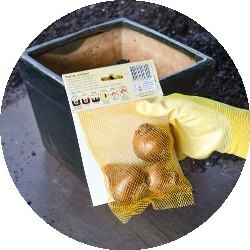 Sort the bulbs largest to smallest. 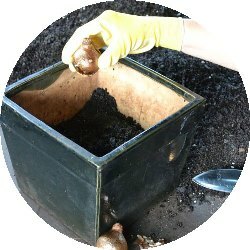 Largest bulbs will go towards the bottom of your container. 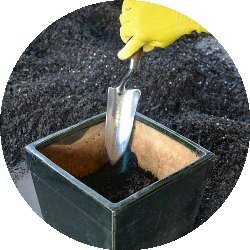 Add compost to the bottom of the pot. 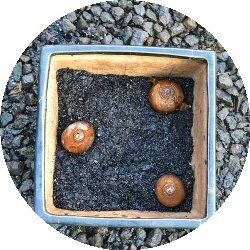 to the soil surface is three times the bulb height. 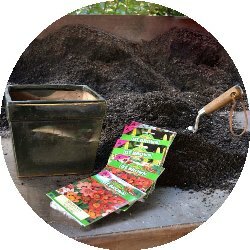 Measure it with our transplanter trowel. 4. Add the biggest bulbs, pointy end up! If there's no pointy end, lay them on their rounded side. or group them, as you prefer. Place them gently - don't press down. 7. Add the smaller bulbs in the spaces. 9. 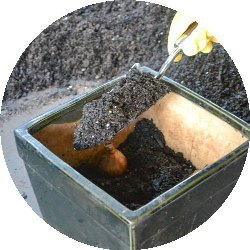 Cover with a final layer of compost. and leave somewhere cool and shady.